petit main sauvage: I'm back! Hi everyone! Work should be really finished (although I did get a text from my former boss during my holiday about a bride whose dress is the perfect length and yet she wants it shorter... sounds very odd. I didn't investigate. I'll have to deal with that if and when I hear from her) and I've just returned from holiday. E and I spent a lovely week in Austria. We planned this as our 'active' holiday, with lots of hiking and other assorted activities. We arrived on a wonderful day. Sunny and about 20 degrees Celsius. We kept hearing that the weather might change soon but, apart from a drizzly Tuesday (on which we went hiking anyway) that didn't happen. 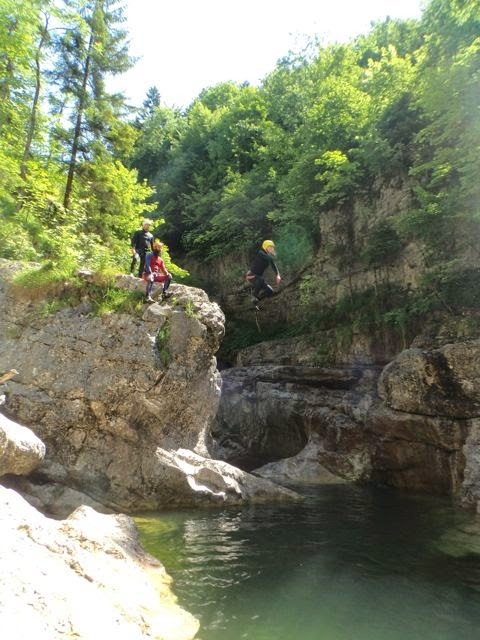 We went canyoning in the Almbachklamm with these guys. 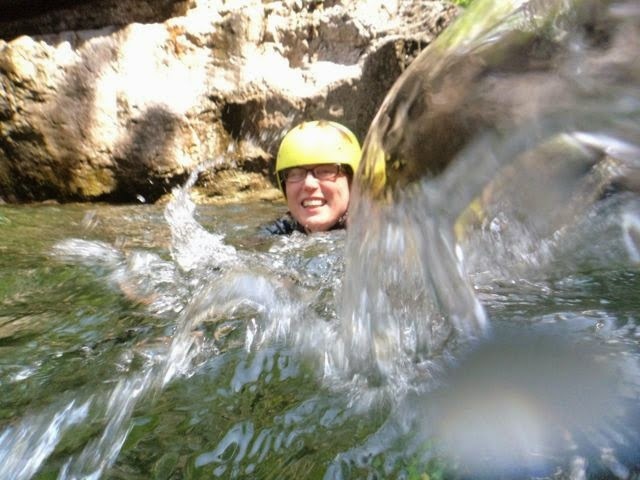 Canyoning is basically walking and swimming in a gorge, and jumping into the deep pools from the rocks. When you do this wearing clothes and go with a guide who knows the place, it's a lot of fun. I think I'm the jumper in the picture. Only the girls had yellow helmets and I was the only girl doing the higher jumps. It also gave E the first real opportunity to try out the waterproof digital compact camera we bought last year. Which made pictures like this possible. 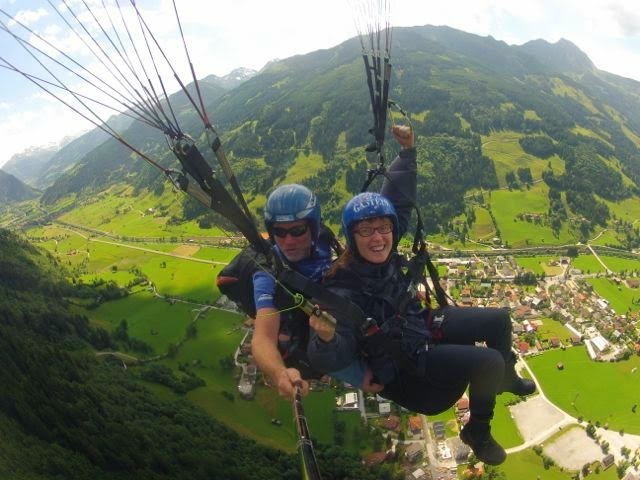 We also went paragliding. It's one of those things we'd been looking at from a distance before and now decided to try. A tandem flight, obviously. 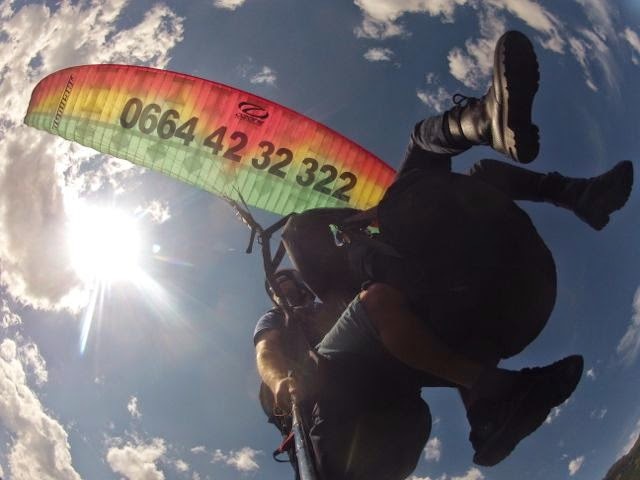 People usually assume paragliding would be scary but it actually isn't (of course, knowing that control is in the hands of a seasoned professional helps). It's exciting and peaceful at the same time. If you don't have a fear of heights, of course. We booked a short flight this time, but we're already thinking about doing a longer one, starting higher, next year. We did a lot of hiking as well. 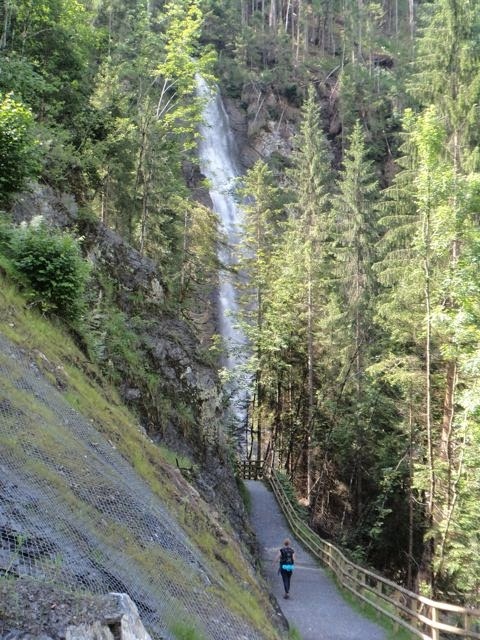 One of those trips took us through this place: the Kitzlochklamm. 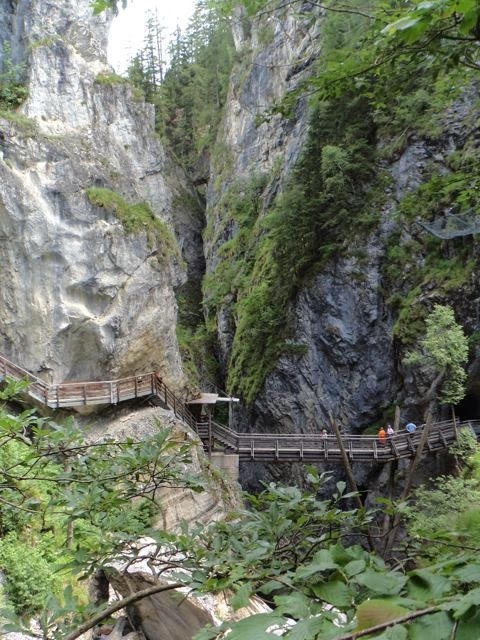 A spectacular gorge cut out by a small river, made accessible with footpaths, stairs and walk bridges. It's an easy route which we walked as part of a round trip and the landscape is great. Other hikes were more challenging and took us up some of the region's smaller mountains. And we went rock climbing. Another guided event, of course (booked via the same people as the canyoning trip). This took place at a small bit of rock face where hooks had been made in the rock, especially for the purpose of climbing. We've done some indoor climbing in the past, but this was our first time on real rocks. More fun. Another activity we'd love to do again. On our last day there, our legs were tired and we figured we wouldn't really enjoy another hike, so we went to a spa instead. And then, yesterday, we drove home again. It was a great holiday. Today we're just getting some groceries and doing laundry. From tomorrow, I'll try to reclaim my full sewing mojo and look into options for work. P.S. We paid for all of the activities with our own money. Any endorsement given here is only an expression of my appreciation, nothing else. That looks amazing. :) Makes me want to get outside. I went 8 years ago, the paragliding unfortunately made me feel sick and I was pretty terrified in the canyoning, but what a beautiful country. Now, that's my kind of holiday!